Make sure you have the best solutions for your favourite sport or leisure activity with Dakine by your side. No matter the season or environment, Dakine engineers solutions that will help you to attain your goals, push yourself further and, above all, enjoy your experience outside to the fullest. Whether you are hitting the surf, embracing an adrenaline-inducing downhill race, a snowboarding fanatic or just starting out in your chosen activity, Dakine helps you to reach your peak performance. 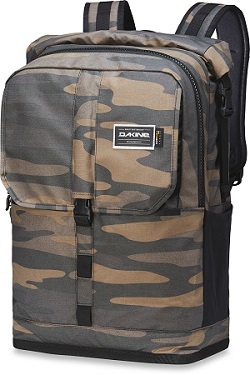 Dakine manufactures solutions for your outdoor adventures. The company was founded in 1979 in Hawaii on Maui’s North Shore by Rob Kaplan. Initially a surfer, he started out by producing high-quality surf gear and accessories. In the early 1980s, Dakine had moved onto innovate various products that would help windsurfers to sail faster, jump higher and operate in more extreme conditions, such as the world’s first ever adjustable foot strap, waist harness, seat harness and thermo-moulded waist harness. By the mid-1980s, the company had relocated to Hood River, Oregon. With its location at the base of Mount Hood, the company began to produce products for snowboarders and skiers too. By 2005, Dakine had also established itself as a manufacturer of industry leading mountain bike products and solutions, cementing their reputation of innovating products and accessories that provide revolutionary solutions for their customers. Whether you plan to hit the slopes or surf the water, Dakine is proud to offer the best solutions for its customers and make gear and equipment that people love using. Built by a team of experts who have a passion for the outdoors, each product is stringently tested out in the field to ensure their customers find the escape and freedom they desire in the great outdoors. Dakine also takes sustainability seriously, striving to reduce impact, all the while making sure each product is robust, functional and refined for optimal performance. Wherever you go, have Dakine by your side.